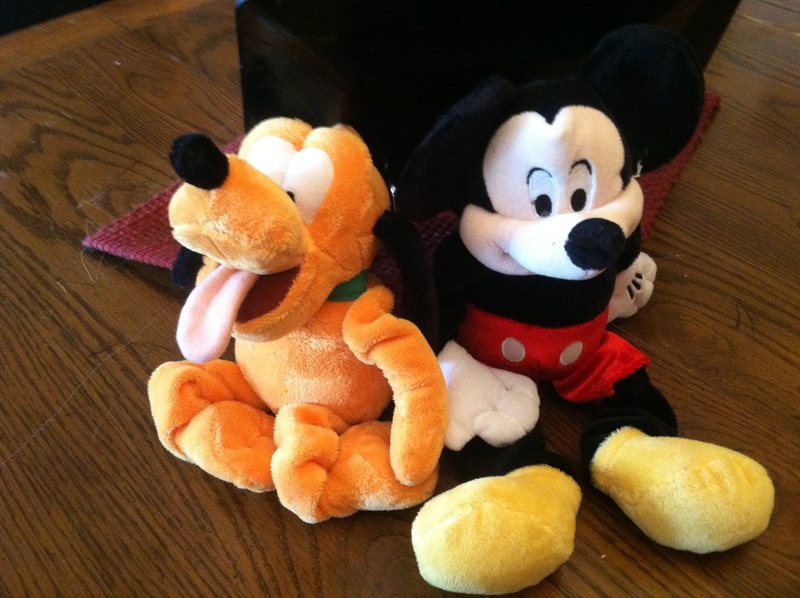 “Hey there, hi there, ho there!” Limited Edition #Disney dog toys are at #PetSmart! ToyShoppe® for PetSmart! They are in the line called Disney Mickey Mouse & Friends. You see, Mom has been fixated with all things Mickey Mouse since she was a little girl. She had Mouse Ears, a Mickey Mouse watch, she was a huge fan of the Mouseketeers !!! Mom’s Dad was an artist and he often used to draw Mom pictures of Mickey Mouse! Mom loved it! 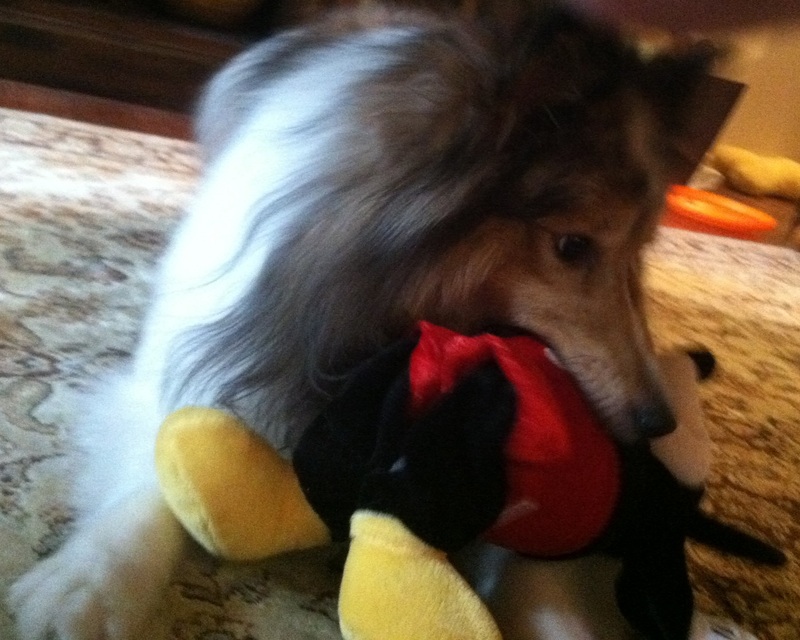 When Mom heard that there were limited edition Disney toys available at PetSmart she was all over it! The kind people at PetSmart sent me two of the cutest toys you have ever seen! I swear I better guard these toys with my LIFE because MOM is all over them!!! She was posing them everywhere! There they are on the coffee table looking all cuddly and adorable! Could someone please tell her these toys are NOT for her? They are for me!!! 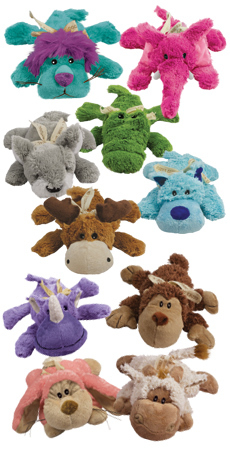 They are SUPER SOFT AND CUDDLY and each toy even has a SQUEAKER inside! They are some of the cutest dog toys Mom and I have ever seen! Mom keeps saying something about taking them away from me and keeping them in her “office.” I don’t think so!! They are MINE! Shhhh…don’t tell Mom that I stole HER TOYS!!! BOL! 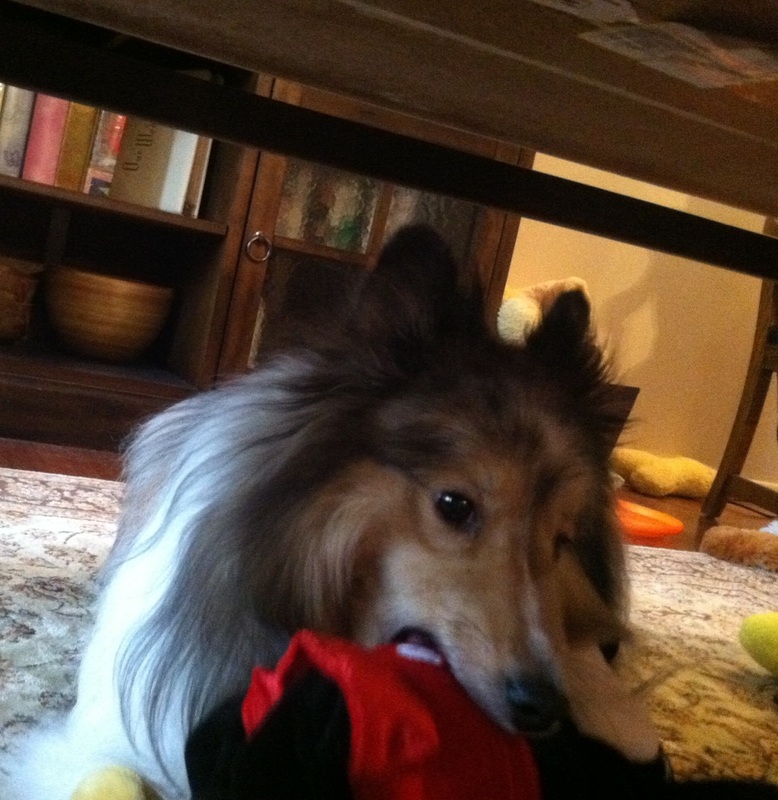 I am keeping Mickey safe, right under the coffee table. That’s where I bring ALL of the toys that I love! 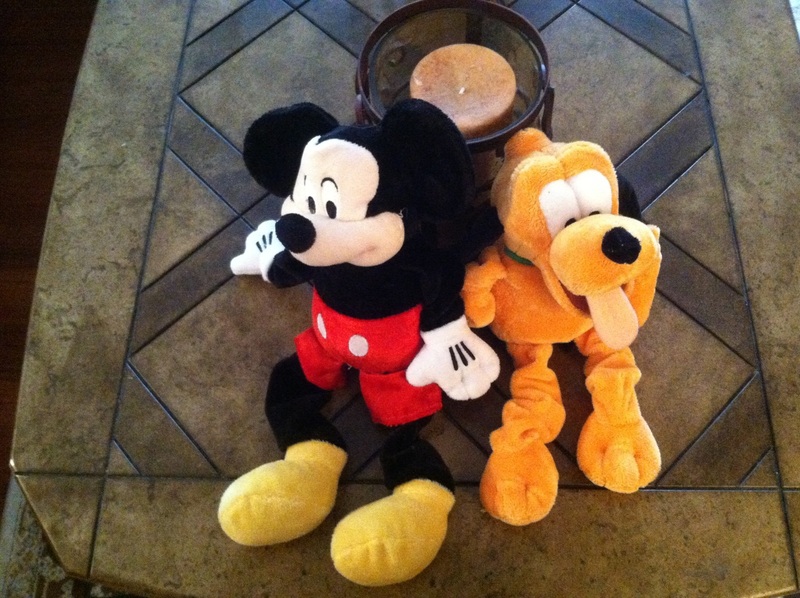 Hurry and go to PetSmart to get your own Disney limited edition dog toys! They are only available until April 21st!! Oh and when you buy some, you better keep them away from your own Mom! You may NEVER get them back! Fun Friday! Puppy Parcel from Five Wags! Enter to Win! It’s finally time!! The long-awaited give-away from our furiends at Five Wags has arrived! First, I would like to thank Reed for his patience with my having misplaced the information telling me who is eligible to win and what they could win! click on their photo to visit them! 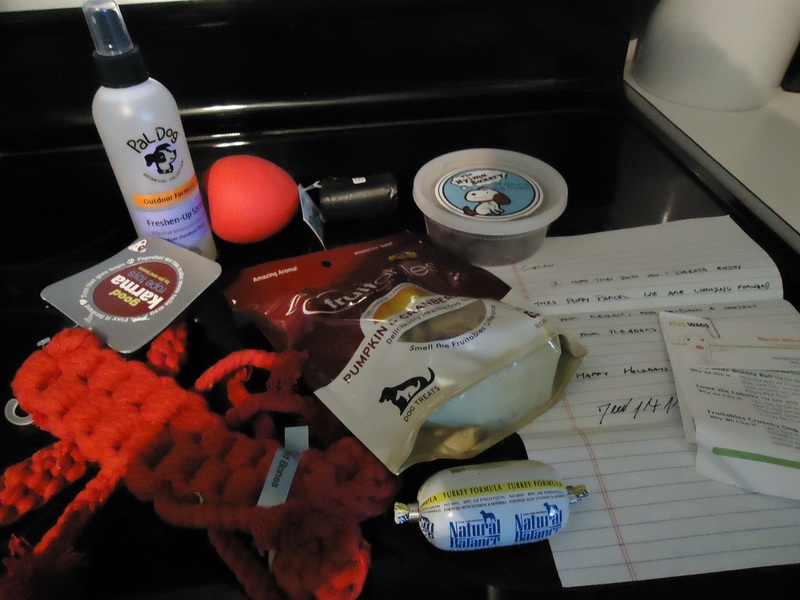 A few weeks ago Reed contacted me asking if I would be interested in receiving a Puppy Parcel from Five Wags. I was intrigued and jumped on the opportunity. What is a Puppy Parcel? The Puppy Parcel is filled with premium dog products hand-selected to match your pup’s personality and interests. Each month, we search for toys and treats for your pup, some classics and some unexpected, always selected to delight your dog and create endless wags! Because every dog is different and special, in order to determine what types of goodies should be included in your dog’s box, Five Wags offers the Puppy Profile Quiz . I filled out the quiz for Dakota and it couldn’t have been easier! After you complete the Puppy Profile Quiz you join by signing up for their monthly membership, and within a week you will receive your first Puppy Parcel delivered right to your doorstep! As long as your membership is active, you will receive a new and fun Puppy Parcel every month! How cool is that? Here are examples of their sample boxes. Dakota received a mixture of two different boxes, based on his interests. They are packaged sooo cute aren’t they? Here is a photo of the products that Dakota received and I will tell you what our favorites were! One item that I received for Dakota that I LOVED was the lavender-scented outdoor refresher spray, Pal Dog Freshen Up Spray for active outdoor dogs. It is meant to use on your dog to “refresh” he or she after playing or hiking outside. What I used it for was the mess that Dakota gets on his mane after devouring some of his favorite bones! I just sprayed it on the brush and brushed his mane and it not only removed the stickiness, but he smelled delightful! Angry Birds Wobbly Ball by Griggles. It wobbles and jiggles and is so much fun! We like to put a treat in ours as an extra challenge. Check out Dakota using it! Fruitables Crunchy Dog Treats were also in the box, they smell good enough to eat! Dakota loves them and what I love is they are small enough to fit in a variety of toys that he has that dispense treats. Another fave was Louie the Lobster by Jax and Bones. I was super impressed with how well made and durable this toy is! It is NOT flimsy! It is hand braided, lasts long (ours is still fine and Dakota is a major chewer!). It is soft enough to play fetch indoors and it is sooo cute! Here are some super short videos of Dakota playing with Louie! In the first video I LOVE how Dakota shakes his head like a horse. Here is another video of Dakota and Louie the Lobster, even after chewing Louie’s lobster claw it is STILL in tact! Dakota and I were super pleased with the process of registering for our review box, the ease of taking the quiz, the speed of delivery, the appearance of the box and the quality of the products. This would also make a great Gotcha Day, Birthday or anytime gift for your dog or the special doggies in your life! Guess what? Reed is offering ONE lucky person WHO LIVES IN THE U.S. a TWO MONTH subscription to the Puppy Parcel!! Do you believe it??? That is incredibly generous! 2) Like Five Wags on Facebook for an extra entry! 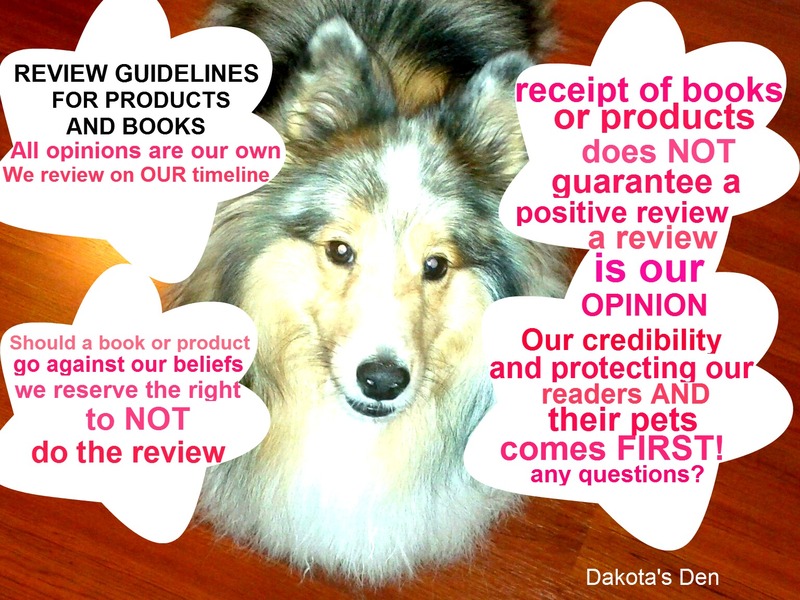 3) Like Dakota’s Den on Facebook for yet another extra entry! THIS IS A QUICK GIVE-AWAY! DEADLINE TO ENTER IS MONDAY JANUARY 28th at 5pm ET. Winner will be chosen by http://www.random.org and will be announced WEDNESDAY, JANUARY 30th. In full disclosure: I was not compensated for this review/give-away. I was sent a Puppy Parcel for one month. All opinions are my own. Dog Toys by Kyjen: Squeaker Mat Character Sheep! Enter to Win! Hi everyone! It’s Dakota! Anyone that knows ANYTHING about Shetland Sheepdogs knows that we are herders, and there is a certain animal that we just LOVE to herd. Sheep!!! Don’t believe me? See for yourself! A few weeks ago I was sitting around feeling kinda blue and I couldn’t figure out why. Then it dawned on me! It hit me like a bolt out of the blue! I had NO SHEEP to herd! Is this cool or what? Click on the photo to visit Kyjen! It’s like Bubble Wrap for dogs! It’s plush, it is super soft and it squeaks! 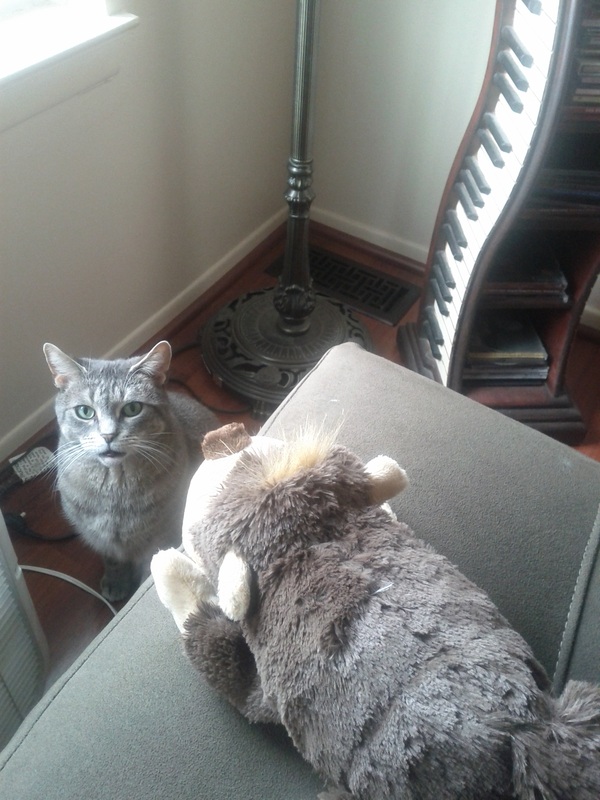 It squeaks everywhere! The squeaker mats are durable, and if I were to take out a squeaker, (which I haven’t), there are plenty more inside of the toy! I love to shake this squeaker mat, I run around with it, it’s so much fun! Unfortunately, Mom couldn’t shoot a video of me playing with my Squeaker Mat Character Sheep because I will only play with it when she isn’t pointing a video camera in my face! Let me show you a video on the Kyjen web site that shows other squeaker mat toys made by Kyjen that are the same concept, they just aren’t the Sheep. When I’m not playing with my sheep I often will sleep with it! Let me tell you my furiends you will love this and guess what? You can enter to win!!! My buddies at Kyjen are going to give THREE LUCKY DOGGIES (We apologize but U.S. only due to shipping costs) their own Squeaker Mat Sheep, just like mine! HOW TO ENTER: Just leave a comment telling me why you want to win the Kyjen Squeaker Mat Character Sheep! Hurry and enter! The contest will close Tuesday, January 15 at 5pm and the winner will be announced Thursday, January 17th! Barks and licks and good luck!! I was not compensated for this review/give-away. I was given a Squeaker Mat Character Sheep to test. All opinions are my own. Fun Friday! The Paw Flapper™ by Kyjen! Enter to win! Hi and Happy Friday all! Mom and I wanted to be sure that the month of December was a FUN month and it sure has been so far! We wanted to show our readers how much we appreciate them and offer a few give-aways, and we have even more fun planned ahead! 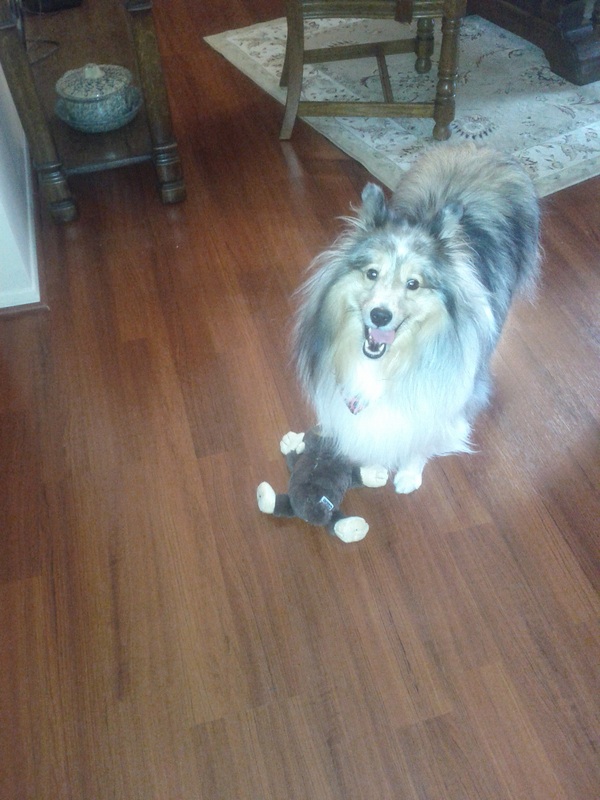 Bet ya didn’t know that I am one of a number of dog toy testers for Kyjen ,and I wanted to show you my latest find! And…when I put my paw print on an email asking my furiends at Kyjen if I could do a give-away for two of my readers they didn’t hesitate to say yes! They jumped on it like I jump on my dinner! The Paw Flapper™ is a two-part puzzle, encouraging dogs to use their noses. They must learn how to lift treat chambers, as well as rotate the toy to retrieve treats. This is an excellent scent test with 8 hidden treat chambers altogether! Now, check ME out havin’ a fun time!! You wanna win one right? Of COURSE you do! GIVE-AWAY: We are giving away TWO Paw Flappers™ !! U.S. AND CANADA ONLY PLEASE. WARNING: there have been a number of give-aways where I have stated SPECIFIC requirements (or tasks) to complete to be entered, and some folks haven’t read all the way through. So, if they didn’t state in their comment what I asked them to state, they were disqualified. You don’t want that to happen, so please read all the way through! HOW TO ENTER: Leave a comment telling me WHAT KIND OF TREAT you would like to find in the chambers of your Paw Flapper™ Also, be sure I have a way to contact you if you are one of the lucky winners! DEADLINE TO ENTER: MONDAY DECEMBER 17th at 5pm. Winners will be announced WEDNESDAY, DECEMBER 19th!! Winner of the Bionic® Flyer!! I want to thank all who entered the give-away for the Bionic® Flyer. I wish I had one to give to all of you who entered, but sadly, I don’t. Friday Fun Find! Bionic® Pet Products And A Give-Away! Hi everyone! It’s Dakota! Wow what a week it has been hasn’t it? Hurricanes, Halloween, a dog doesn’t get a break does he? Well, today I am bringing you a MUCH NEEDED break and A LOT OF FUN! 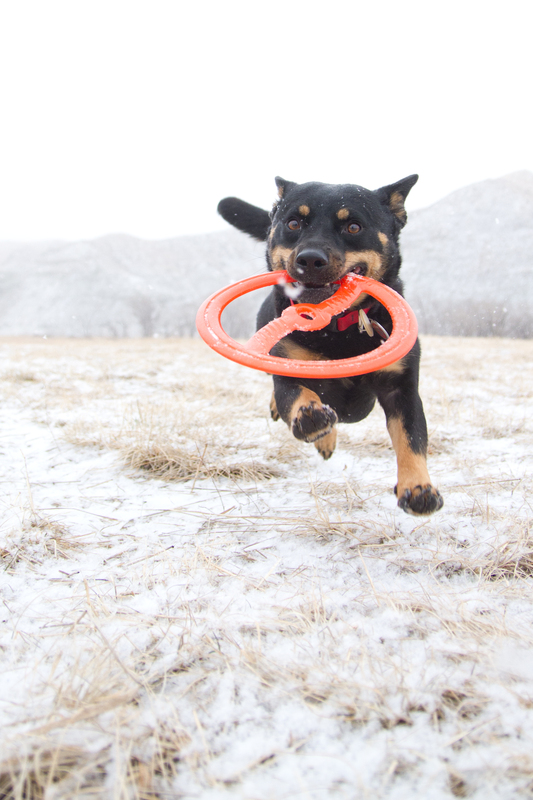 Bionic® Pet Products was launched after the Luhrs family dog, Duke, successfully destroyed another new toy with ease. They combined their knowledge of designing products for strength, their scientific expertise in materials that are durable and were able to create toys that stand up to the most aggressive doggies, no matter how much they chew! That’s right up my alley! What is super cool is these particular toys are a part of the expansion of Bionic® Pet Products popular line of ultra-tough toys into MEDIUM AND SMALL sized toys! That means that now not just the BIG BOYS (or GIRLS) get to have fun, we medium-sized and small dogs get to have fun too! Why did Bionic® Pet Products want to include miniaturized additions? The answer is easy-peasy! Bionic® Pet Products wants to provide shoppers with more options when selecting the proper size and shape for their pet. When designing their toys, Bionic® Pet Products demonstrates an advanced understanding of geometry and science. 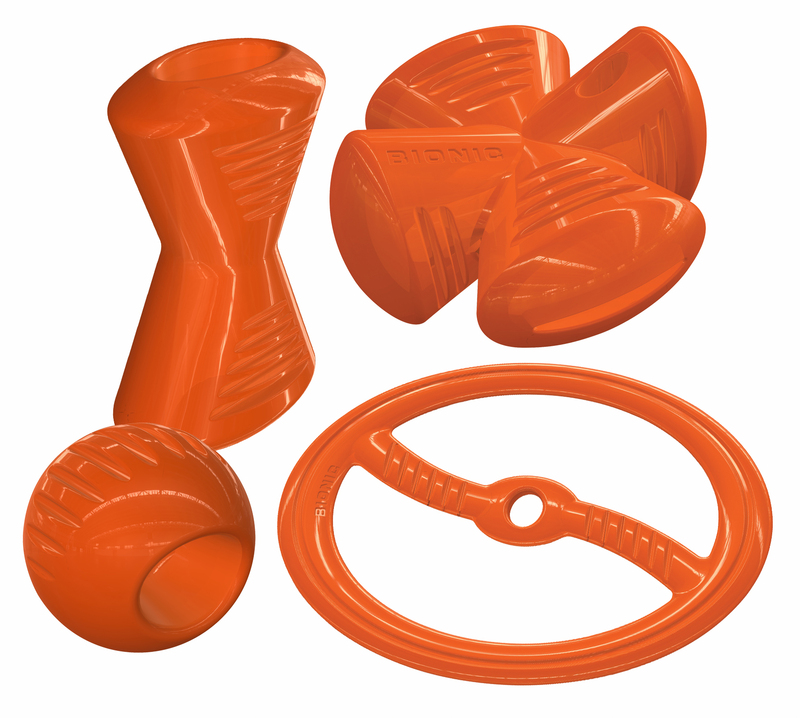 Each size and shape is specifically tailored for the appropriate dog’s bite and strength. Don’t ya just love the Halloween-ish color of these toys? The are such a cheerful orange! Bionic® toys are flexible, bouncy, and practically puncture proof. Even with my shark-like teeth! They are made from FDA Food Grade materials that are non-toxic. They come in innovative shapes and the great color makes them easy to see while playing outside or in the water. Speaking of PLAYING, WANNA WIN? MANDATORY: leave a comment telling me what size you would like should you be the lucky winner! Be sure to tell me in the comments that you did the extra entries for extra chances to win!!! In full disclosure: I was not compensated for this review. I was given the products to test/review and all opinions are my own. Hi guys! It’s Dakota and I am here to tell you about a really cool website that contacted me, and I want to show you 2 products they sent to me to tell you about! click on logo to visit them! Click on photo to read more about it!!! This toy is SUPER COOL! Mom apologizes that there are no photos of me playing with it…that is because Mom was sick and wasn’t able to take any, but trust me, my favorite thing to do with this toy is to have Mom put TREATS in it! Click on photo to visit website and read more about it! Mom LOVES THIS!!! It even matches our decor! It also matches my fur! Mom was certain she found something that I would actually SLEEP on so she picked this when asked by the kind people at myfavoritepetshop.com what I would like! 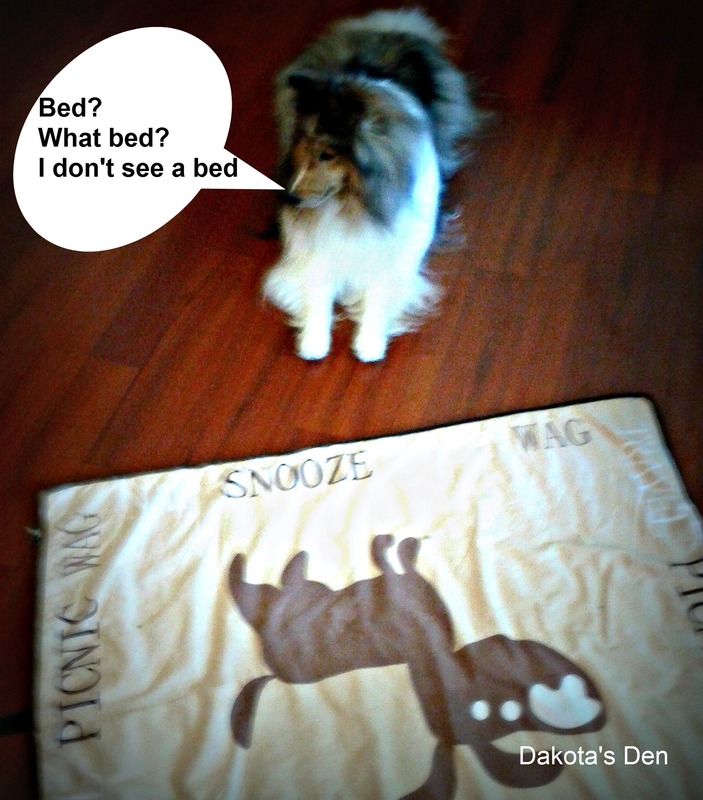 “You and your dog are sure to love this soft quilted nap mat. Made with faux suede 100% Polyester. Did I sleep on it? “The best laid plans of dog bloggers”….eh? That was pretty darned MISCHIEVOUS OF ME EH? Take Mom’s word for it! 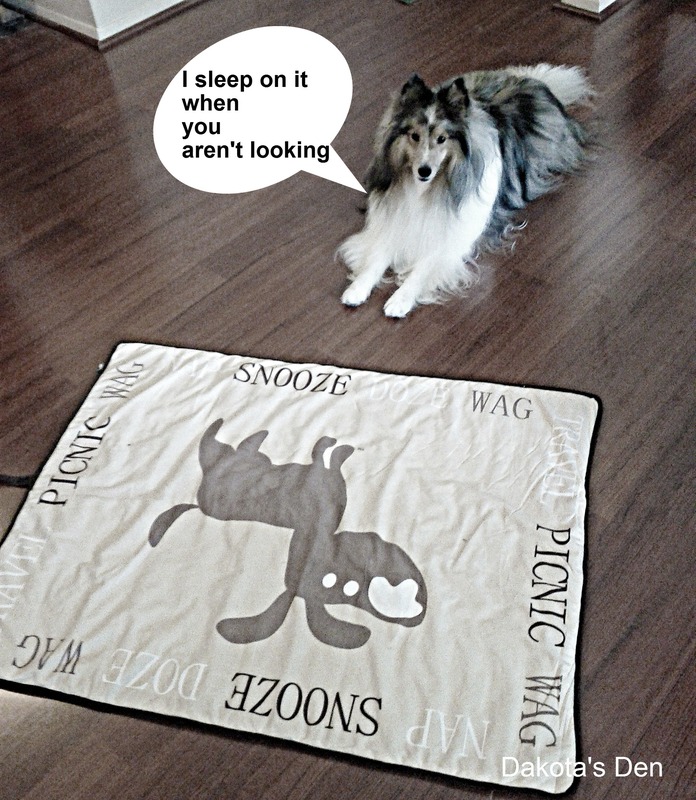 This mat is too cute and Mom says she is sure that somewhere out there, there is a doggy who APPRECIATES super cute things! 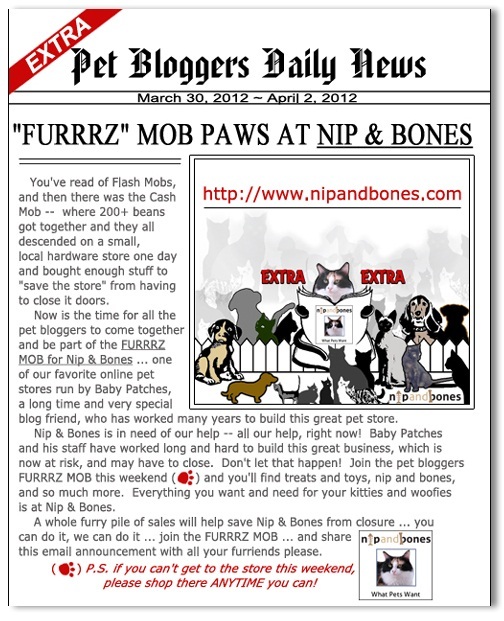 We wanted to join other bloggers and spread the word that our friends over at www.nipandbones.com are in danger of having to close their amazing website and we don’t want that to happen. My Mom has pawchased a few things from them in the past and I have even tested a few, and we think they sell high quality merchandise and should stay in business! Won’t you stop by and check them out? I am sure you will find SOMETHING for the special doggie or kitty in YOUR life! Here is a video of one of the items that Mom pawchased for me there! They have all sorts of stuff! Please go and check them out! THANK YOU!! You Can Get Cozy With KONG Cozies! A Give-Away! Boy oh boy was my tail ever waggin’ when I received a giant box of goodies from KONG! Any dog worth his bones knows that KONG manufactures some of the most durable, superb quality, creative toys on the planet. The KONG toys aren’t the type that are ruined in one enthusiastic bite, no sirree!! These babies are made to last! 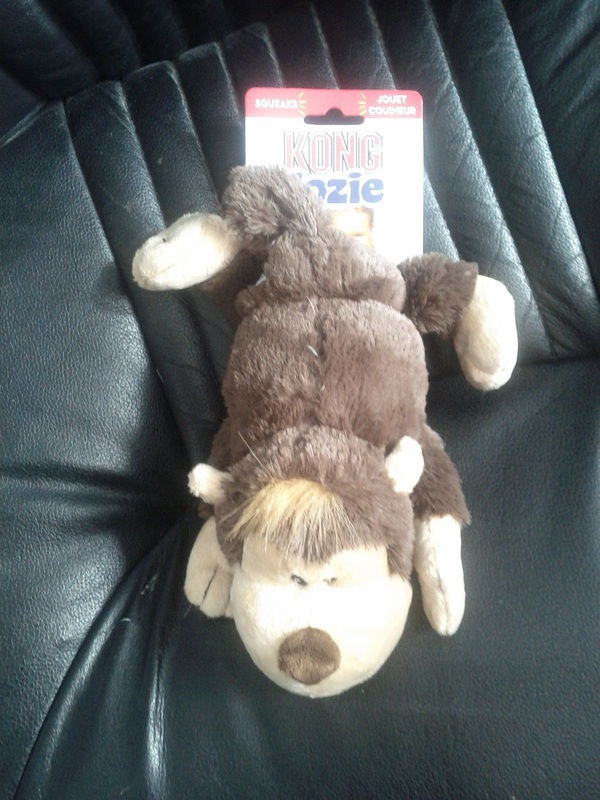 Speaking of babies, KONG now has a line of plush toys called Cozies. I know, I know, you think you are a tough doggie but we all get our times when we start thinking of how life was when we were pups and we just get the urge to cuddle! Or, we feel like picking something up, shaking it or throwing it, not to be mean mind you, but just to put some fun into our routine! It was soooo hard to choose which one I wanted. I had to carefully inspect the box, sniff each one for quality control, and I even had to taste the box to see what type of packaging material was used. All of this to make sure that they met my high standards. It was so difficult to choose! Each Cozie really lives up to its name. 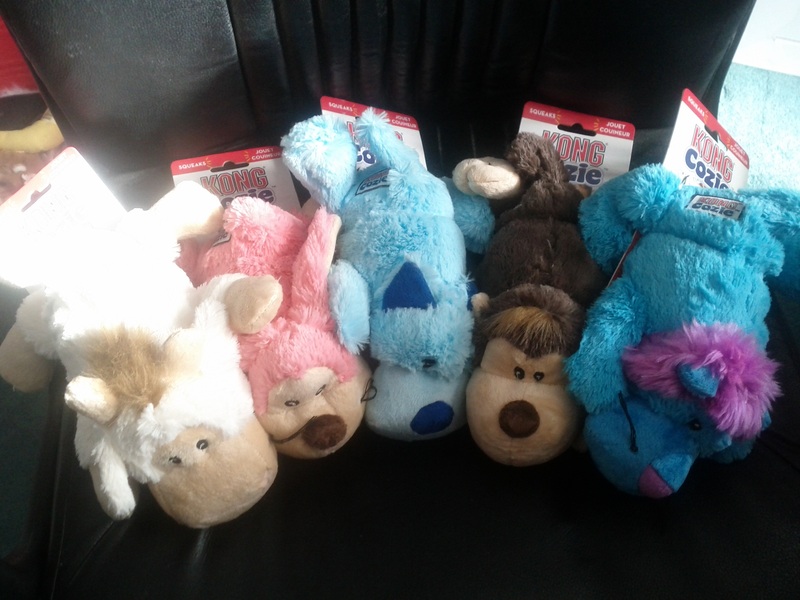 Doggy friends these are the softest and most cuddly toys EVER! Want to know which Cozie toy I chose for myself? I love this monkey so much that I just had to smell him, kiss him and put the “bitey” on him! He took it all like the good sport that he is! My brother, Cody even tried to get in on the action! Hey "Cat Chat" Boy!! That's MY Monkey! Give him back! Can I play with Spunky too Mom? 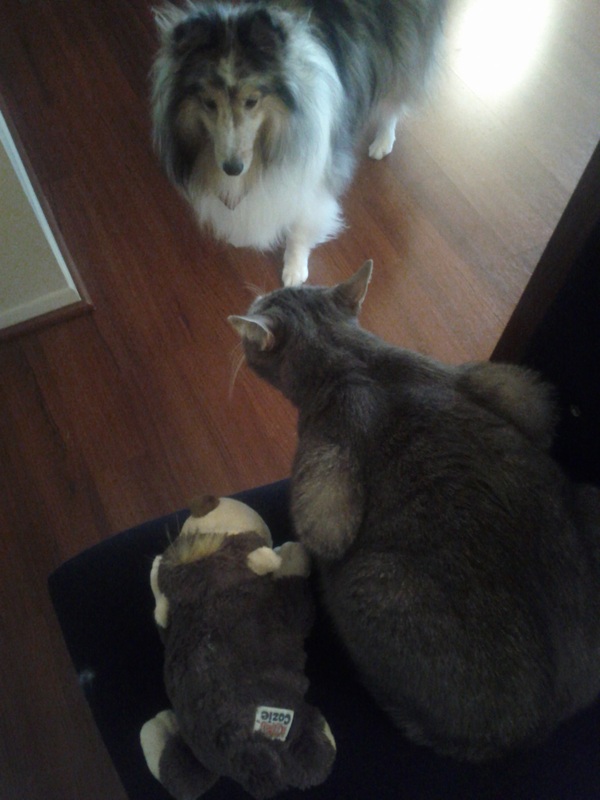 Cody can’t play with Spunky or any of the other KONG Cozies. Want to know why? Because the extra four KONG Cozies aren’t for me! The incredibly kind and generous people at KONG said that FOUR OF YOU CAN WIN ONE!! Yep you heard that right! HOW TO ENTER: The first two requirements ARE MANDATORY!!!! 2) Leave us a comment telling us which KONG Cozie is your favorite! 3) “Like” Dakota’s Den on Facebook and leave us a comment there! Entries must be received no later than MONDAY, NOVEMBER 7 at 11PM EASTERN…WINNERS WILL BE ANNOUNCED WEDNESDAY, NOVEMBER 9TH. THANK YOU NICE PEOPLE AT KONG! !